Pharaoh said of Joseph, “How might we find such a man, in whom is the Sprit of God?” O Lord Jesus, we ought to say of You, “How might we find such a Lord, in whom is the Spirit of God as much as He is in You?” You are anointed with the Holy Spirit without measure (John 3:34). You are anointed “with the oil of gladness above Your companions” (Ps. 45:7). This was visually confirmed by the Holy Spirit when He came to rest on You at the Jordan (Matthew 3:16). Therefore You Yourself said in Isaiah 61:1, “The Spirit of the LORD of Lords is upon Me, because the LORD has anointed me.” And Isaiah 11:2 says, “Upon Him the Spirit of the LORD shall rest, the Spirit of wisdom and understanding, the Spirit of counsel and might, the Spirit of knowledge and of the fear of the LORD,” etc. O Lord Jesus, the oil of gladness flows over You. When I stand under You in true faith, I too partake of Your powerful anointing, and I am made a true Christian. You pour Your Holy Spirit from Your heart into mine so that He mingles with my spirit and bears witness with my heart that I am a child of God (Rom. 8:16). Your Spirit makes me confident in prayer, patient in cross, courageous in every trial, and fearless in death. Pharaoh said of Joseph “God has shown you all things.” I too may truthfully say this of You, for You plainly say, “No man knows who the Son is except the Father, or who the Father is except the Son and he to whom the Son will reveal Him” (Luke 10:22). Oh Lord Jesus, I will show You all things, I will entrust all my secrets to You with the certain hope that You will not forsake me. 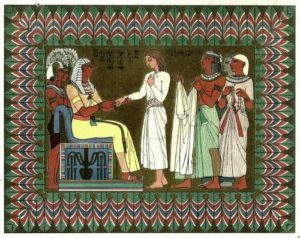 Pharaoh said that there was “none so discerning and wise” as Joseph. O Lord Jesus, there is none so discerning and wise as You. The manner of Your rule is incomprehensible (Ps. 147:5). “Your wisdom is greater than can be measured.” May Your wisdom deliver me from my blindness. To You, the only wise Lord Christ, be honor and praise and glory forever. Joseph was to be over Pharaoh’s house. O Lord Jesus, You are over the house of the whole Christian Church. You are “the head of the body, namely, the congregation” (Col. 1:18; Eph. 1:22). You provide for us so that we do not perish. You are our Eye, our Guidepost. You are our highest Adornment, and if we appear before Your heavenly Father without You, we seem to Him a hideous monster. You are our King and High Priest (Ps. 110:2[, 4]; Heb. 9:11). If we should lose You it would cost us eternal life. Therefore may we glorify You above all things and follow You in all our affairs. Pharaoh further said to Joseph, “To your word shall all my people be obedient.” O Lord Jesus, how much more to Your Word, then, ought the whole world be obedient (Matt. 17:5)? For such Your Father desires: “To Him shall you listen” (Matt. 17:5). Whoever does not listen to You, Your Father will require it of him (Deut. 18:19). Mary’s last words in the Bible are “Whatever the Lord says to you, do it” (John 2:5). This is her last will. Therefore I will listen to You and do what You tell me; then I cannot err. Whoever listens to You, You will listen to him also when he calls on You in prayer. Pharaoh told Joseph, “Only in the throne will I be higher than you.” Joseph was second to the king. O Lord Jesus, when I number the three persons of the blessed Trinity in the Creed and recount what each has done in the work of my salvation, I likewise number You second after Your heavenly Father, calling You the Second Person of the Most Blessed Trinity, yet I confess that You are equal with the Father and the Holy Spirit in glory and majesty. Joseph’s majesty was quite distinct from Pharaoh’s, but You are seated in equal might, glory, power, and majesty with Your Father and the Holy Spirit. Oh, what a great and mighty Protector I have in You! O Lord Jesus Christ, grant that I may take comfort in this in all my troubles. Yet at the same time let me also contemplate Your humble words, “The Father is greater than I” (John 14:28). Oh Lord Jesus, You are equal to Your Father in respect to Your Godhead but less than Your Father in respect to Your manhood, as Athanasius says. You esteemed Your Father greater because of Your profound humility, for You humbled Yourself and became our kinsman. You humbled Yourself to the point of death, even death on the cross (Phil. 2:8). Oh, what blindmen they are who would rob You of Your deity because of Your humility! Are not the lords of the world only acclaimed and exalted the more when they show humility? Your lowly humility will not cause me to doubt Your divine majesty but rather to esteem and adore You all the more highly. Amen.